Published: Dec. 30, 2018 at 06:36 p.m.
Seattle Seahawks running back Chris Carson turns on the jets for an impressive 61-yard run. Published: Dec. 30, 2018 at 05:17 p.m.
Seattle Seahawks running back Chris Carson stays on his feet and propels himself into the end zone for a 7-yard touchdown. Published: Dec. 23, 2018 at 11:35 p.m.
Seattle Seahawks running back Chris Carson bulldozes into the end zone for second touchdown. 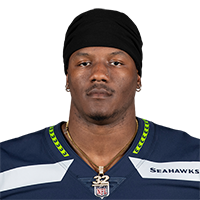 Published: Dec. 23, 2018 at 08:42 p.m.
Seattle Seahawks running back Chris Carson refuses to go down on physical touchdown run.